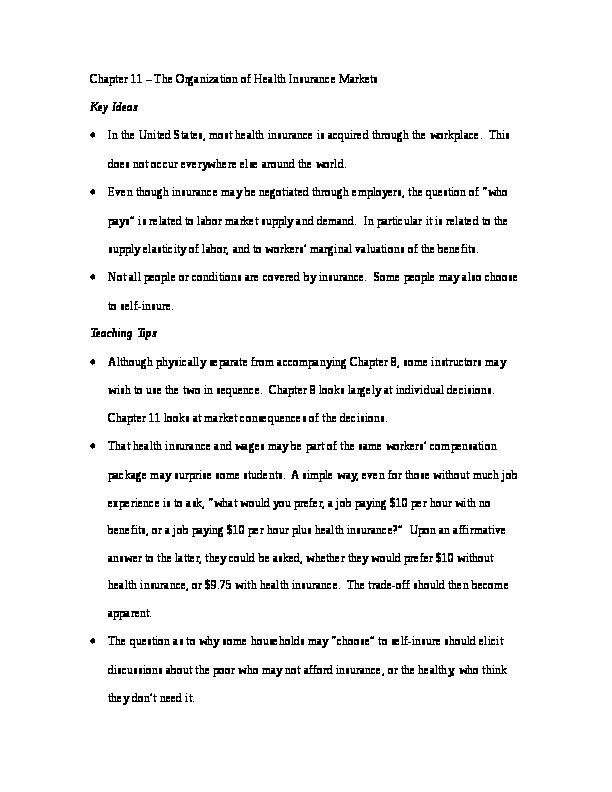 Chapter 11 – The Organization of Health Insurance Markets Key Ideas In the United States, most health insurance is acquired through the workplace. This does not occur everywhere else around the world. Even though insurance may be negotiated through employers, the question of “who pays” is related to labor market supply and demand. In particular it is related to the supply elasticity of labor, and to workers’ marginal valuations of the benefits. Not all people or conditions are covered by insurance. Some people may also choose to self-insure. Teaching Tips Although physically separate from accompanying Chapter 8, some instructors may wish to use the two in sequence. Chapter 8 looks largely at individual decisions. Chapter 11 looks at market consequences of the decisions. That health insurance and wages may be part of the same workers’ compensation package may surprise some students. A simple way, even for those without much job experience is to ask, “what would you prefer, a job paying $10 per hour with no benefits, or a job paying $10 per hour plus health insurance?” Upon an affirmative answer to the latter, they could be asked, whether they would prefer $10 without health insurance, or $9.75 with health insurance. The trade-off should then become apparent. The question as to why some households may “choose” to self-insure should elicit discussions about the poor who may not afford insurance, or the healthy, who think they don’t need it. Box 11-3 addresses the problems of counting the uninsured. Periodically (in the United States) new counts of the uninsured are announced. Using the approaches discussed in Box 11-3 may provide some insights into differences in the numbers reported. The Goddeeris model is a dynamic model, and many undergraduate students may find it unusual. If the innovator does nothing, then we are at the origin, with m (change in expenditures) equal to 0, and h (change in health) equal to 0. “Standard” technological change (where quality is not improved) occurs where the h (m) curve, hits the horizontal axis, providing the same h, and a negative m.  Chapter 11 – The Organization of Health Insurance Markets – Multiple Choice The gain from insurance ______ as the probability of filing a claim approaches ______. increases; 0. increases; 1. decreases; either 0 or 1. * remains unchanged; 1. Which of the following statements is false? As the expected loss decreases, the gain from insurance decreases. High loading costs partly explain why it is difficult for the self-employed to get health insurance. Increased loading costs may reduce insurance coverage for certain groups. Consumers are willing to pay more to avoid risk in cases where an adverse event is almost certain to occur. * Which of the following statements is false? The number of people with private insurance coverage has increased dramatically since the 1940’s. Community rating is the practice of charging everyone in a given location the same insurance premium. Due to growth of HMOs and PPOs, many Blue Cross organizations have become nonprofit firms. * In community-rated plans, low-risk clients subsidize the premiums of the high-risk. The number of people without health insurance in the United States at any point in time is approximately: 25 million. 50 million. * 65 million. 75 million. Jane would like a new job, but she is afraid of losing her health insurance coverage because of a preexisting condition. This is an example of job lock. * frozen medicine. insured selection. a steady state. In analyses from Table 11-1, one sees that from 1990 to 2009, the number of uninsured has: risen by 10% to 40 million. risen by about one-third to 45 million. * stayed the same. risen by about half to 50 million. Table 11-1 shows that from 2007 to 2009 the number of insured Americans stayed constant. This is explained by ____ in those privately insured and ___ in those insured by government programs: decreases; increases. * increases; decreases. increases; increases. decreases; decreases. Which of the following statements is false? Because of wage and price controls, employers started offering health insurance benefits during World War II. The tax system lowers the relative price of health insurance with respect to other consumer goods. Economies of scale may allow employers to purchase insurance at a lower price than individual consumers. High marginal tax rates discourage the purchase of expensive health insurance plans. * Table 11-2 shows that adults ages ___ have the largest percentage uninsured: 19 to 25. * 25 to 34. 45 to 54. 55 to 64. Table 11-2 shows that the ____: poor are less likely to be uninsured because of government programs. poor are more likely to be uninsured than the more affluent. * are more likely to have Medicaid than the more affluent. Answers (b) and (c) are both correct. *  In Figure 11-2, suppose that the Atlas Company offers a benefit that costs Atlas $1 per hour but is worth $2 per hour to the employees. In the new equilibrium, wages + benefits per worker will _____ and total employment will ____. fall; rise. * rise; fall. rise; rise. fall; fall. In Figure 11-2, suppose that the Atlas Company offers a benefit that costs Atlas $0.25 per hour but is worth $0.10 per hour to the employees. In the new equilibrium, wages + benefits per worker will _____ and total employment will ____. fall; rise. rise; fall. * rise; rise. fall; fall. Employer-provided health insurance may have economic benefits because: it leads to healthier and more productive employees. it provides pooling of workers without adverse selection. it increases governmental tax revenues. Answers (a) and (b) are correct. * Women with who have had Cesarean births may be denied coverage due to “pre-existing conditions.” Insurers who deny this coverage are trying to: prevent the moral hazard from higher cost clients. prevent adverse selection of higher cost clients. * satisfy the preferences of those consumers who buy their insurance. increase profits by enlarging the pool of potential buyers. In Figure 11-3, the consumer switches to a more insurance-intensive wage and benefit package. This is an example of the ________ effect, because the relative price of insurance has fallen. substitution. * income. tax. Answers (a) and (b) are correct. From Figure 11-4, we can deduce that: workers for small firms are most likely to be uninsured. * workers for small firms are uninsured because they do not need insurance. self-employed workers are most likely to be uninsured. public sector workers are most likely to be uninsured. Bill’s gross pay per week is $500, and every week he purchases $50 worth of health insurance. Assume Bill's marginal tax rate is 10%. If Bill's health insurance were purchased through work, his net pay (take-home less insurance) would change from _____ to ___. $350; $370. $360; $390. $400; $405. * $400; $420 Suppose that Bill’s gross pay per week is $500, and every week he purchases $50 worth of health insurance. Assume Bill's marginal tax rate is 15%. If Bill's health insurance were purchased through work, his net pay (take-home less insurance) would change from _____ to ___. $350; $370. $360; $400. $370; $377.50. $375; $382.50. * A new insurance mandate in the city of Harrison requires employers to provide their employees with balding insurance. The cost to employers is $1.00/hour; the value to employees is $1.50/hour. What are the likely consequences of this mandate? The demand and supply curve for labor will decrease. Gross wages and employment will increase. Gross wages will decrease and employment will increase. * Answers (a) and (b) are correct. Workers in the South Pacific negotiate an increase in health insurance benefits worth $0.25/hour. The additional cost to employers is $0.25/hour. What happens to the market wage rate and employment level in the South Pacific? The wage rate remains unchanged and the employment level increases. The wage rate falls by $0.25/hour and employment remains unchanged. * Both the wage rate and the employment level fall. The wage rate increases and the employment level falls. Small businesses may not offer health insurance because of: high price. high price and redlining. high price, redlining, and employee preference. high price, redlining, state mandates, and employee preference. * The effect of state health insurance benefit mandates on employment is similar to _______ , in that unemployment ________. the minimum wage; increases. * price ceilings; increases. rent control; decreases. None of the above. In Figure 11-4, suppose that workers at the Betelgeuse Company pay a wage of $9.00 per hour, and the local minimum wage is legislated to be $8.50. Suppose that the workers negotiate a benefit worth $1.00 to them, but costs Betelgeuse $2.00 to provide. In the new equilibrium, the money wage will be _____ and the level of employment will be ______. $10.00; lower. $10.00; higher. $8.50; lower. * $9.00; unchanged. A mandated second night’s stay for normal births will likely: improve birth outcomes. increase costs to insurers. reduce government revenues. answers (a) and (b) are correct. * Of the mandates listed in Table 11-3 ___ is the most common: mental health parity. dental anesthesia. breast reconstruction. * emergency room treatment. Refer to the figure below. Point A represents an innovation that ________ costs and ________ health status. increases; increases. decreases; decreases. decreases; increases. * increases; decreases. h = change in health status B h(m) A m = change in medical costs Refer to the figure above. An increase in coinsurance rates is represented by a movement from point _____ to point ______, and is likely to cause ________ in medical inflation. A ;B; an increase. * A ; C; a decrease. B ; A; an increase. C ; A; decrease. Refer to the figure above. At point A ____. medical costs are rising and health status is falling medical costs are falling and health status is rising. * medical costs are constant and health status if falling. medical costs are falling and health status is constant. Refer to the figure above. At point C: medical costs are constant. health status is constant. both medical costs and health status equal 0. Answers (a) and (b) are correct. * Insurance increases medical inflation mostly through its inducement of cost-increasing technologies. * direct effect on consumer demand. inducement of unnecessary care. income effect on physician supply.